Best Buy Tablet Best Prices August 25 - 31, 2017. 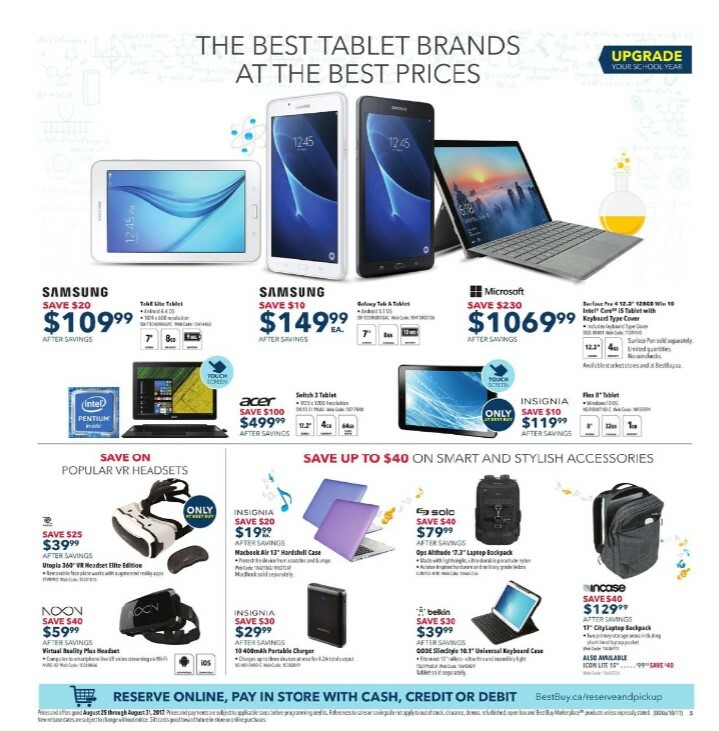 Find the best tablet brands at the best prices this week on Best Buy store Canada. Upgrade your tablet now! Get latest flyer about tablet on page 10. Price for Samsung Galaxy Tab 7" E Lite 8GB Android 4.4 Tablet #SM-T113NDWAXAC Sale Price $109.99 Save $20.00. Also find Samsung Galaxy Tab A 7" 8GB Android 5.1 Tablet Model #: SM-T280NZKAXAC Now price $149.99 you can save $10.00 (The redesigned Samsung Galaxy Tab A maintains the perfect marriage of work and play. A powerful quad-core processor delivers smooth multi-tasking performance, while a high resolution 7" touchscreen display produces brilliant images for a captivating viewing experience). Buy with special price for Microsoft Surface Pro 4 12.3" 128GB Windows 10 Tablet & Keyboard #DQQ-00001 now Price only $1069.99, Get a $230.00 saving for this week's purchase. Power and portability reach new heights with the Microsoft Surface Pro 4. This innovative 2-in-1 laptop tablet is incredibly lightweight and impressively powerful. The high-contrast 12.3-inch PixelSense display reduces glare and eye strain, and the custom Type Cover 4 clicks easily into place, offering well-spaced backlit keys and a large trackpad. Shop for Acer Switch 3 12.2" Touchscreen Convertible Laptop #SW312-31-P0MV Get this week price $499.99 save $100.00 for this week's purchase. Portability and productivity in total harmony. The Acer Switch 3 12.2" convertible laptop is powered by an Intel Pentium N4200 processor and 4GB of RAM. It features a full-size snap-on keyboard and u-frame kickstand to support optimal angles for typing for viewing. It has dual cameras and offers Wi-Fi, Bluetooth, and USB 3.0 connectivity. Save on popular VR headsets that is Retrak Utopia 360° Elite VR Headset #ETVRPRO $39.99 Sale Price $25.00 Savings. And NOON VR Plus Headset #NVRG-02 On price $59.99 $40.00 Savings. Insignia Viola 13" Shell Case for MacBook Air #NS-MMP132U-C - Price $19.99 Get savings $20.00 for this weeks purchase (Guard your 13" MacBook Air with this stylish Insignia hard shell case. It's made from a stong polycarbonate material with a nonslip exterior for durability and easy carrying. It's designed to ensure proper heat dispersion and offers full access to all of the device's ports and plugs). Lowest price for Insignia 10400mAh Portable Charger #NS-MB10400-C Now Price $29.99 Savings $30.00 for this week's purchase. Charge up to 3 devices simultaneously with this Insignia mobile battery. It features adjustment technology that intelligently identifies your device to deliver the fastest possible charge. Solo Altitude 17.3" Laptop Backpack Model #: UBN750-4/10Sale Price $79.99 $40.00 Savings. Belkin QODE 10" Slim Universal Keyboard Case Model #: F5L179ttBLK Sale Price $39.99 $0.00 Savings. Incase City 17" Laptop Backpack Model #: CL55569 - Price $129.99 Savings $40.00 for this week's purchase. Whether you're heading to school or walking around town, this full-size City backpack from Incase has your back. Its 360-degree padded laptop compartment protects your MacBook when you're on the go, while the large organizer compartment, fleece-lined iPhone pocket and 2 zippered stash pockets make organization easy. These Best Buy flyer run from Aug 24 - 30, 2017. In Addition Best buy Prices, and stock may vary by location. 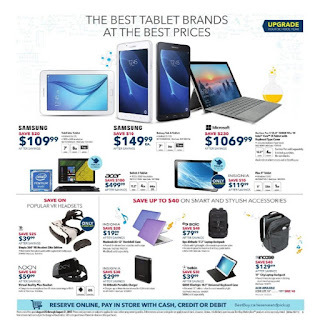 To get regular posts, subscribe to Best Buy tablet flyer and all discount will be yours.